During your first appointment with us, one of our Grand Rapids dentists will do a thorough oral examination and take digital dental x-rays to diagnose any issues you have. If you have concerns about your teeth or gums, come to your appointment ready with questions to ask your dentist. Our dentist will be able to create a personalized treatment plan to fit your oral health needs. You’ll need to bring the completed health history form to your appointment. Your patient health record helps us create a custom treatment plan and determine whether you have risk factors for certain oral health issues. For example, it’s helpful for our dentists to know if you have diabetes because it increases your risk of gum disease. You’ll also need to fill out paperwork regarding HIPAA, especially if you wish for us to disclose your dental records and information to someone other than yourself. The dentists at GR Family Dental are dedicated to helping you maintain a beautiful healthy smile. If you have any questions between now and your first appointment, give us a call at (616) 455-3020. Schedule Your Appointment With GR Family Dental Today! Copyright © | GR Family Dental | All Rights Reserved. Disclaimer: This website is provided for information and education purposes only. No doctor/patient relationship is established by your use of this website. No diagnosis or treatment is being provided. The information contained here should be used in consultation with a doctor of your choice. No guarantees or warranties are made regarding any of the information contained within this website. This website is not intended to offer specific medical, dental or surgical advice to anyone. 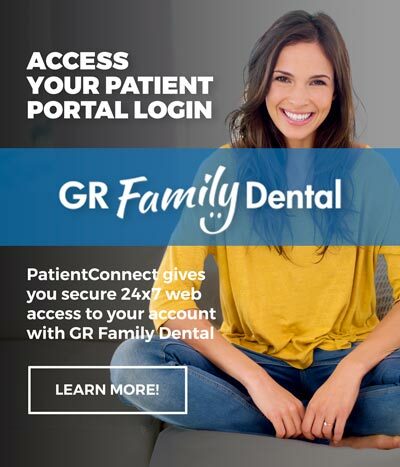 Further, this website and GR Family Dental take no responsibility for websites hyper-linked to or from this website and such hyperlinking does not imply any relationships or endorsements of the linked websites.